It is with great sadness that I report that we have lost an amazing jurist on the Georgia Appellate Bench, Judge Debra Bernes. Judge Debra Bernes was truly an incredible woman and wonderful judge. Gone too soon. I will miss her and the citizens of the State of Georgia will miss her, because we have lost a compassionate heart and voice on the Georgia Court of Appeals with her passing. My heartfelt thoughts and prayers go out to her husband and family. God Bless You. Georgia Court of Appeals Judge Debra Bernes, a former Cobb County prosecutor who won one of the most unusual elections in state history, died Tuesday after a long bout with cancer. 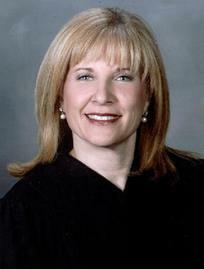 Georgia Court of Appeals Judge Debra Bernes has died after a battle with cancer. Bernes, 54, was first elected to the appellate bench in 2004 and was running unopposed for re-election this fall. Her funeral will be held at 10 a.m. Thursday at Ahavath Achim Synagogue in Atlanta, with her internment to follow at Arlington Memorial Park in Sandy Springs. Two years ago, Bernes was diagnosed with renal cancer that metastasized throughout her body, family member Bill Hendrick said. She had been hospitalized and given only hours to live over the weekend. Nancy Ingram Jordan, who worked with Bernes in the Cobb County District Attorney’s Office and later as a law partner, called Bernes a remarkable woman. “She loved her family, loved the rule of law and she is going to be missed terribly,” Jordan said. Bernes had a sharp legal mind and was compassionate about the less fortunate, said Georgia Supreme Court Justice Robert Benham, who first met Bernes almost three decades ago when she was a Cobb prosecutor. Bernes won election to the appeals court in a race that generated startling amounts of campaign cash and looked like it would never end. She ultimately won the crowded race after a recount and then another ordered election because a candidate’s name, Howard Mead, had been incorrectly listed as “Thomas Mead” on 481 ballots in Laurens County. She won a runoff against Mead, who raised a record $3.3 million for his unsuccessful campaign, most of it through personal loans. Bernes, a past president of Cobb’s bar association, once chaired the Cobb Chamber of Commerce public safety committee and was a board member for the Jewish Educational Fund and the William Brennen Jewish Home. Bernes served as a trial prosecutor in the Cobb County District Attorney’s office and later specialized in appeals. She left the DA’s office in 2000 and became a private attorney. Bernes, who earned her undergraduate and law degrees from the University of Florida, was from Atlanta, a 1973 graduate of Grady High School. She is survived by husband, Gary Lee Bernes, and two adult children, Lane and Matt.